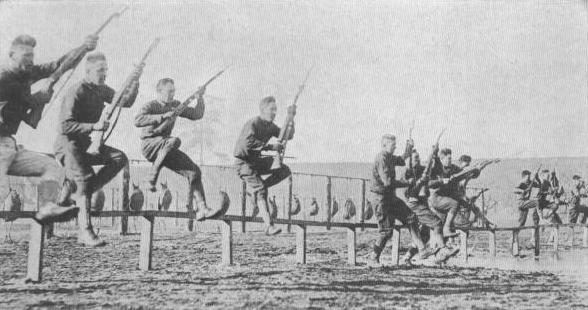 GOING OVER THE TOPThese new soldiers are shown in a vivid "attack on the enemy" at an American military training camp. Although they are inexperienced in the game, it will be observed that they are putting plenty of pep in the sham charge. 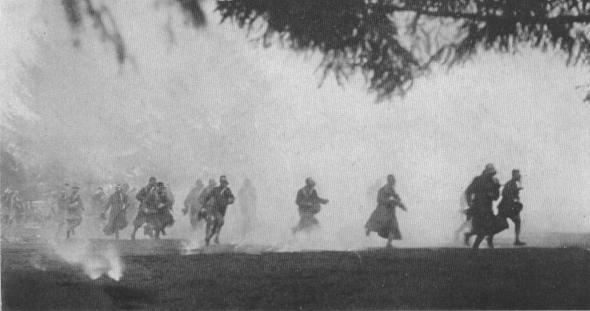 GASA charge to Victory through gas-laden air, Soldiers, with gas masks donned, are charging through a hail of exploding gas bombs toward "enemy trenches." With constant false alarms, "gas jitters" became common at the front.